Bill and Joe are both on the U.S. Track Team. They also both broke world records last year. Bill broke the world record for the high jump with a jump of 8 ft. Joe broke the world record for the long jump with a jump of 26 ft, 6 in. Now Bill and Joe are having an argument. Each of them think that his record is the best one. You need to help them decide. 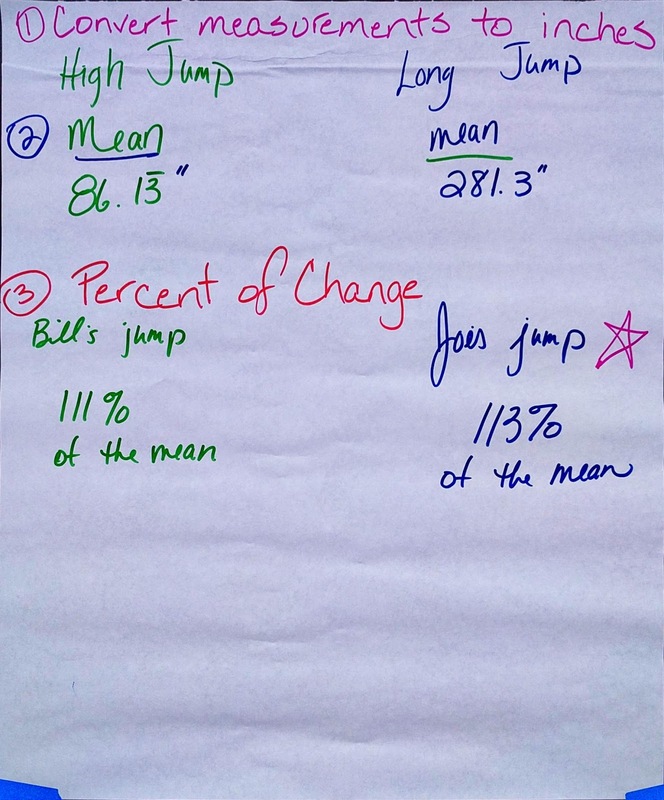 Based on the data in the table, decide if 8 ft shattered the high jump record more than 26 ft 6 in. shattered the long jump record. When I used this task with teachers a few years ago in our task analysis research it was rated quite highly: 5 out of 6 teachers said it rated as "Doing Mathematics" in Smith and Stein's (1998) cognitive demand framework and the task was unanimously judged as a good example of a task likely to engage students in Standard for Mathematical Practice #3, construct viable arguments and critique the reasoning of others. 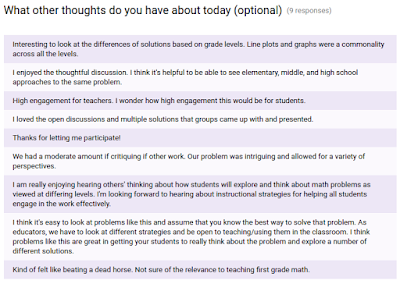 For the summer workshop I was working with about 20 math teachers who would be grouped by grade band (elementary, middle high) and I asked them to attempt the task using the abilities expected of students at their grade level. I admit, this makes for a somewhat artificial exercise, but I wanted to see if this task would stretch across a lot of different levels of student ability and elicit a very wide range of student strategies (even if the "students" were teachers). As a planning guide I used Smith and Stein's 5 Practices for Orchestrating Productive Mathematics Discussions. I used CMP's Launch, Explore, Summarize as an instructional model. My focus practice was facilitate meaningful discourse from Principles to Actions, and I especially wanted to sharpen my pressing and linking talk moves. The Talk Science Primer from TERC is an excellent resource on talk moves. I used a form of "student self-check" in the style of practical meausures to help me reflect. There is a lot of overlap in the 5 Practices, Launch/Explore/Summarize, and the goal of facilitating meaningful discourse. That's a good thing. 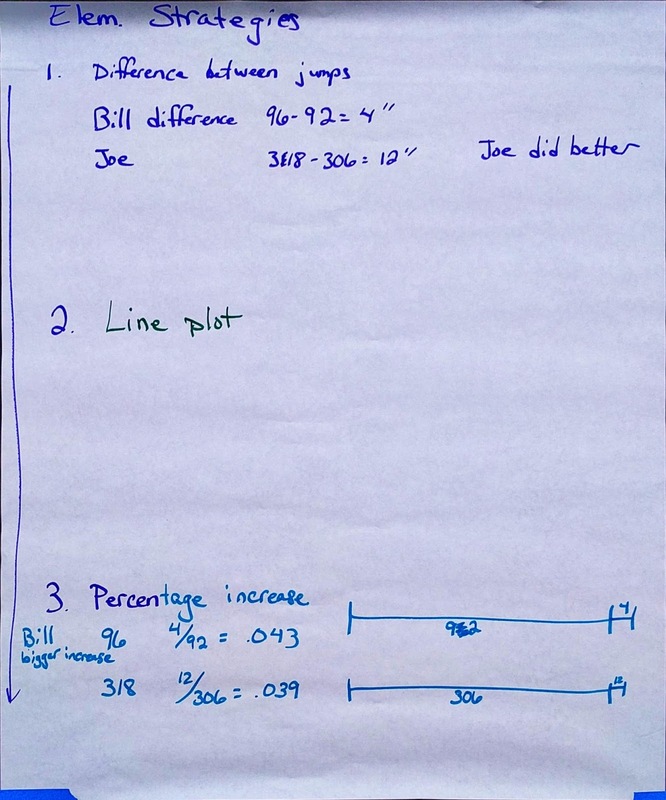 I expected the elementary school group to focus on measuring distances and visual comparisons, and to bring up struggles around working with feet and inches and the under-developed sense of ratio. 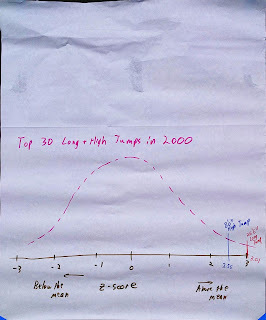 I expected the middle school group to calculate means and use proportional reasoning (like, "The record is 110% of the average), and perhaps use mean absolute deviation (MAD) as a measure of variability. I expected to see struggles in accounting for the multiple jumps at each distance, in calculating MAD, and debates around using mean vs. median as a measure of center. 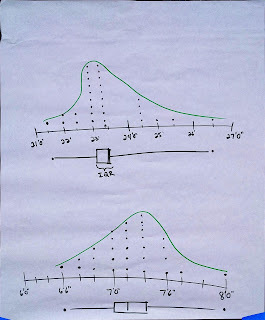 I expected the high school group to be similar to the middle school group, but to use standard deviation instead of MAD. For the launch phase I avoided giving away any hints or clues about possible strategies. It was difficult to design a launch that connected to prior knowledge because of the artificial nature of teachers playing the role of students, so I took a moment to ask the teachers to think about the knowledge they'd expect students to have given the standards at their grade levels. "Can you tell me why you think that is correct?" "What do you mean by 'farther'? Is it because you added? What else might you do to measure 'farther'?" Questions like this designed to press for student thinking were often met with teacher speculation about student thinking. As solution strategies came together, I noted them on my phone with the goal of selecting (the third of 5 Practices) two strategies per group to discuss during the whole-group summary phase of the lesson. The sequencing plan (the fourth of 5 Practices) was to discuss elementary first, then middle, then high school, with the less sophisticated strategy presented first at each level. 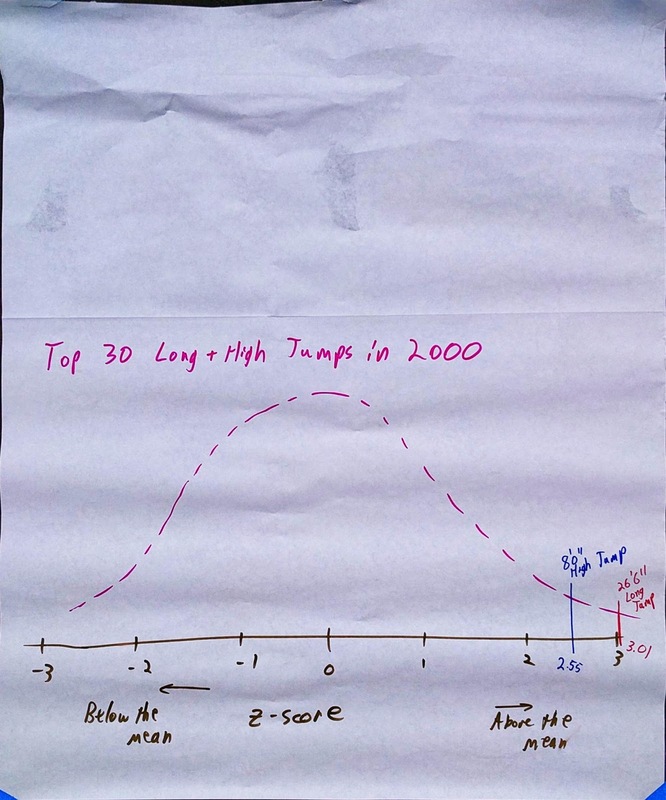 There was less to differentiate these two strategies, as both groups calculated standard deviations and z-scores as a way of measuring how far above the mean was each record jump. "How does your strategy compare to the first one from the elementary group?" (Following an explanation by Kathryn) "Tammy, do you have any questions for Kathryn?" "Phillip, how might your argument change if you used Dan's method?" I had some hits and misses in my anticipation of the strategies I saw. 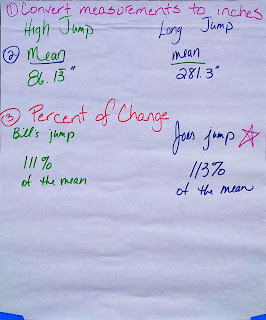 The elementary teachers didn't share my expectation of focusing on measurement and comparing those measurements. 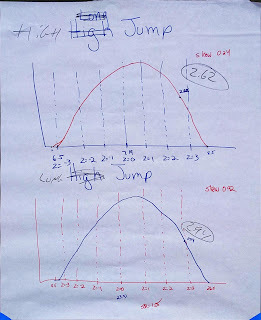 Instead, they made some useful comparisons between the record and second-best jumps. 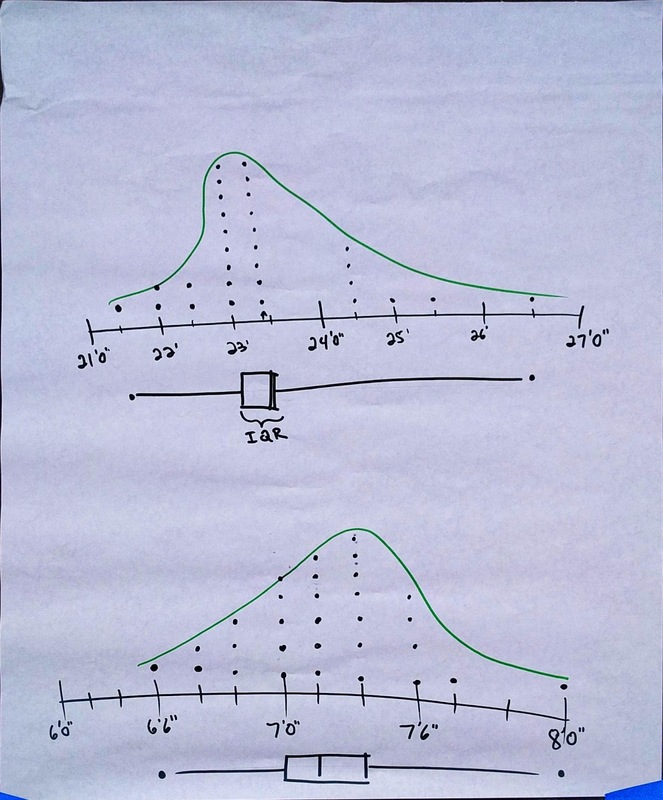 I also didn't anticipate the dot plots and fitted curves in the second poster. 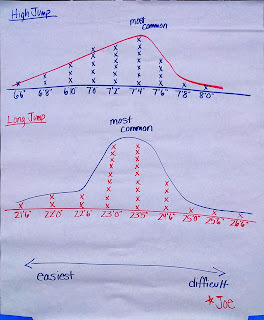 I know it's uneasy to underestimate the capabilities of elementary students, but these kinds of graphs were not something I anticipated their teachers producing. 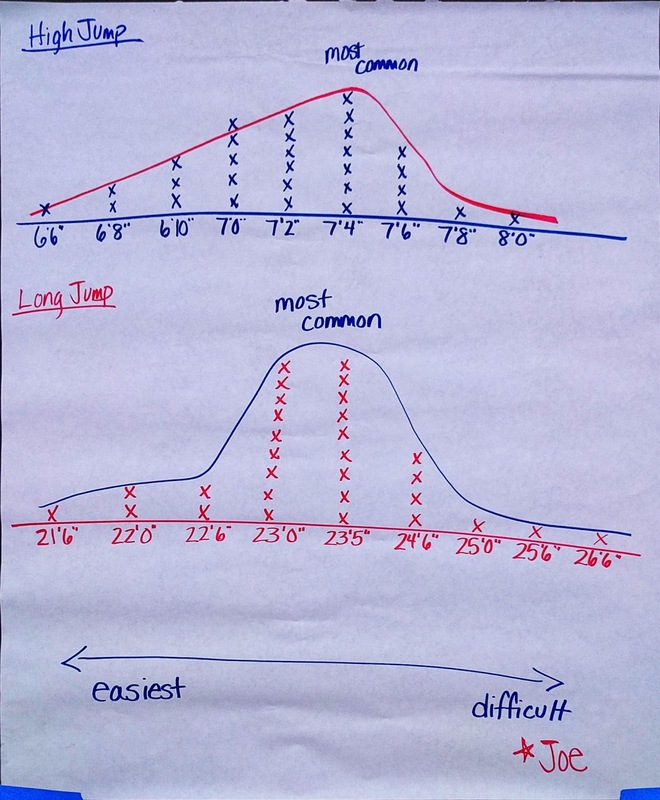 The middle school group used proportional reasoning, as I expected, but instead of MAD they used IQR as a reference for judging the two jump records. There was one "student" who quickly worked through some MAD calculations towards the end of the work time, but it was a bit late to fit into my selection strategy. For high school, the work was less differentiated and more advanced than I anticipated. Some of this can be attributed to just labeling the group "high school" rather than "9th grade" or "AP Stats." I was able to practice my talk moves to some degree, but this artificial scenario was less than ideal. In the explore phase of the lesson my questions were generally met with speculation about student strategies, not answers as students might give them. That was great for us all to think through the task together, but it interrupted the flow of responses you'd expect with talk moves in a more typical classroom scenario. The discussion in the summarize phase was pretty good. 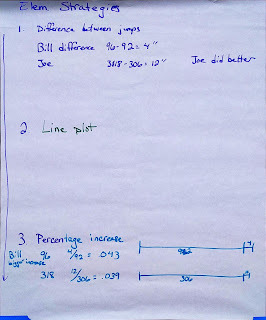 Not only did we compare strategies and connect ideas in the way I anticipated, there was a welcome amount of analysis of the task itself and the different layers of ambiguity in how the data was presented. 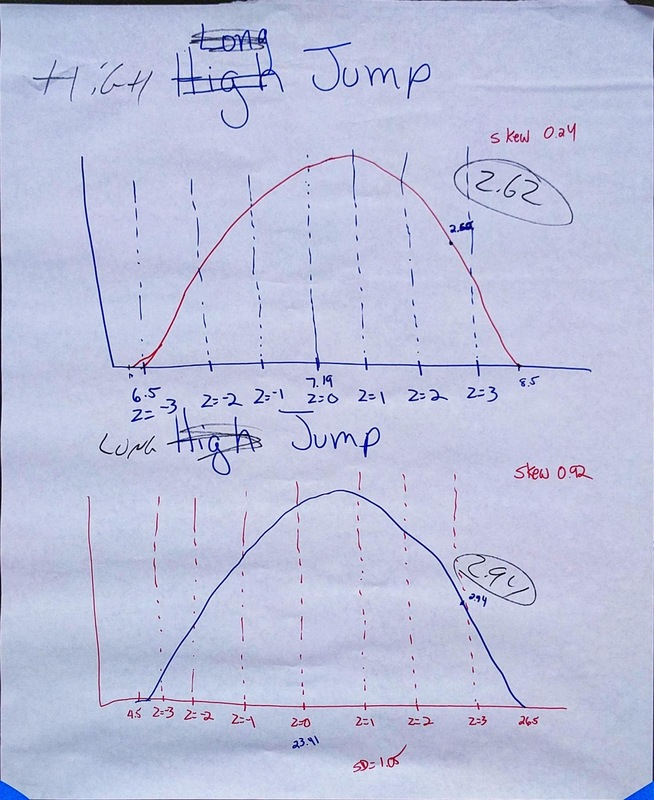 For example, we don't know if the jumps all represent different jumpers, or if the jumps represent jumps in one vs. multiple competitions. We generally agreed that some amount of ambiguity would be good when using this task in a classroom, particularly to hit the "make sense of problems" part of SMP #1. As part of the reflection I collected data in the form of a "self-check," created in the style of "practical measures" that we've used in our research projects. In hindsight, this data doesn't focus much on my choice of teaching practice (facilitating meaningful discourse), but I like the idea of asking students for feedback that go beyond mastery of content. The responses are a bit difficult to interpret because I'm not sure how many participants responded as teachers versus the students they were sort-of-pretending to be. 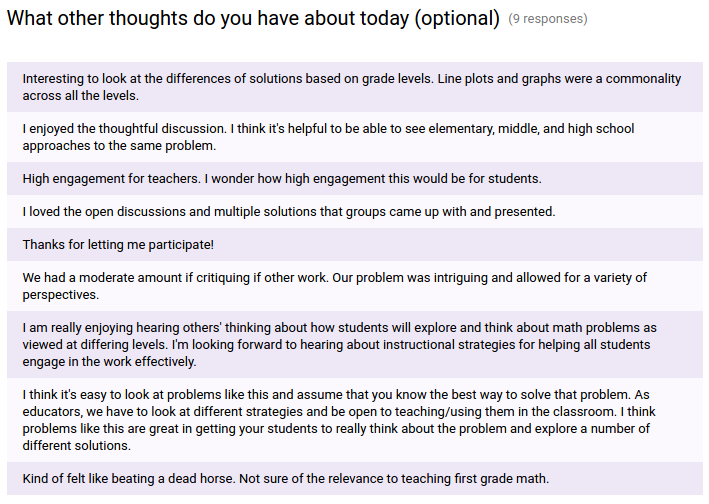 The results seem mostly positive, and I agree with the very last comment: While the task had reach across many grade levels, first grade was too much of a stretch. Smith, M. S., & Stein, M. K. (1998). Reflections on practice: Selecting and creating mathematical tasks: From research to practice. Mathematics Teaching in the Middle School, 3(5), 344–350.